"I modified this recipe with an extra 1/4 cup white sugar. I also added a modifier so that you can make extra streusel to smash around the bottom and sides to form a crust. 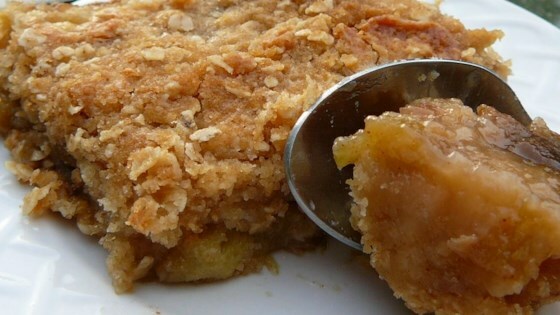 The crumble on the top is extremely delicious!" Combine rhubarb, white sugar, 2 tablespoons flour, egg, and 1/2 teaspoon cinnamon together in a large bowl until evenly coated. Spread rhubarb mixture into the prepared baking dish. Mix 1 1/2 cup flour, brown sugar, oats, and 1/2 teaspoon cinnamon together in a separate bowl. Cut in butter using a pastry cutter or two forks until topping is crumbly. Sprinkle topping over rhubarb layer. Bake in the preheated oven until hot and bubbling, about 40 minutes. Serve hot or cold. It's particularly important to include the egg in the rhubarb mixture to avoid the filling being too runny. I really like this recipe. I did not add the egg and instead added extra flour. I also added an extra cup of rhubarb. Perfect!! made the recipe as written and added 1 1/2 cups frozen strawberries. Excellent!